A consummate innovator, Julio Cortazar was—in my opinion—one of the greatest writers of the 20th century. Seriously, anyone who hasn’t read Hopscotch should run immediately to the nearest bookstore, library, or friend’s shelf, and get a copy. This is a perfect example of the old cliché about how lucky someone is to have not read a particular masterpiece because he/she has the marvelous opportunity of experiencing such greatness for the first time. The rest of us who have already frolicked through Cortazar’s most playful book—which is made up of three sections, “From This Side,” “From the Other Side,” and “From Diverse Sides,” with chapters from the last section read completely out-of-order and interspersed into the other two parts almost like a proto-hypertext work—are left wishing that he had lived a bit longer or that something new of his will suddenly surface. Breakfast: oranges, biscuits, fig jam, coffee. 8:18 Departure beneath a light fog. 8:25 We’ve come as far as Semur-en-Auxois. 8:29 Stop: AIRE DE RUFFEY. These “Travel Logs” mark time in the book, and along with the wonderful drawings of the rest stops they help the reader trace this southward journey. But the real fun is found in the little vignettes written at each rest stop once they stop, set up camp in their van, pull out their lounge chairs, and try to live a peaceful, bohemian existence right next to a stream of speeding cars. 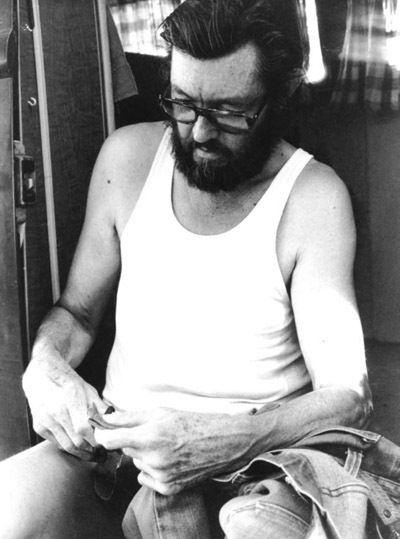 Julio Cortazar adjusting his pants. Initially these pieces focus on the unique oddities of their journey and on acclimating to living in rest stops. There are some beautiful nature pieces, reflections about modern life, lots of comments about Belgian and British tourists, and a very interesting string of paranoid pieces when the two authors begin to believe that they are being followed and observed by freeway workers. Like other rest stops, this one has an area arrived at by following a series of signs that say: CHILDREN’S PLAYGROUND. The games seemed to be varied, rustic, nice. Seemed to be. They seemed varied, rustic and nice until the illumination. Games for children—those constructions with thick planks for bases, those shapes that inevitably evoked another kind of game based on horror and suffering? 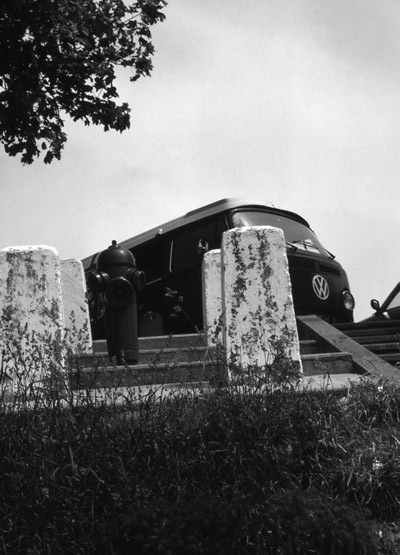 Everything came together in a second, and we knew the truth: we were in the place where witches are punished and executed, and the rest area was a masterpiece of camouflage designed to hide what only an expedition and long experience like ours could discover. There’s also a short story dedicated to Raymond Chandler, and the very funny series of “Letters from a Mother,” which imagine a woman traveling to and fro on the freeway who keeps running into this strange couple at various rest stops. When I went back to the car, your father announced they had to change the oil. He really chooses the best moment for everything, and I find it hard to understand such a lack of preparation at his age. So I went for a walk through the woods, and I even went close to that strange couple’s van. All the curtains were drawn, in the middle of the afternoon. Maybe it’s true that the detective novels I’ve been reading are going to my head, but at my age, you know, a little excitement every once in a while is something that does a person good. I approached the van very slowly. Oh, Eusèbe, you don’t know how my indiscretion made me blush! What they were doing in there! It turns out they’re not married, of that you can be sure! Do you think they’re on the run from the police and they think the freeway is a good place to hide? I’m sure it’s not allowed . . . Equally as charming as the text itself are the wonderful photographs included in the book. Shots of Fafner (their van), of the nature alongside the highway, of Cortazar writing (there are quite a few of these), all add a unique element to this book. For the reader, these pictures help to verify that they really did undertake this crazy mission, and these pictures make the whole enterprise look quite enjoyable.